Some people have a knack for math and science. Others find their calling as an artist or writer. But what about the creative person who also has technical skills and interests? Finding a path that satisfies those seemingly distinct character traits can be a challenge. It’s a quandary that Derek Christiansen faced as he neared the end of his high school years. He had been leaning toward a career in electrical engineering and computer science, but it didn’t quite seem like the right fit. There were opportunities for creativity, sure, but he felt drawn to other pursuits like digital art and photography. His answer came when he volunteered to help out with a high school charity fundraiser. On his first day, the organizers sat Christiansen in front of a control console and told him he’d be in charge of lighting the show. A week later, he ran the controls live, hitting light cues as the action unfolded. “They could never get me out of that room again,” he said. Now the 21-year-old USC student is a whiz on pretty much every major lighting console on the market. As a design major at the USC School of Dramatic Arts, he helps put on student-led performances and is one of very few highly trained lighting technicians who can produce a major show at Bovard Auditorium. His experience is particularly helpful when things go off script, like during a recent high-profile ballet performance. Thirty seconds into the show, half of the moving lights stopped working. Christiansen sprinted backstage, figured out the snag and got everything back online within minutes. Christiansen’s unique blend of imagination and technical know-how is undoubtedly part of the reason he received the prestigious Stamps Scholarship, a merit-based award that covers his tuition at USC. It also provides a $20,000 enrichment fund to enhance his education, and Christiansen is putting it to good use. He has outfitted himself with tons of theater gear and is in the midst of launching a new theater company with some of his classmates. If you’ve been to virtually any performance at USC in the past couple of years, there’s a good chance you’ve seen Christiansen’s work. The junior has helped out at every official venue on campus, and he’s always on the lookout for unconventional spaces to put on a show. Each setting has its own challenges, both technical and creative. It’s the perfect way for Christiansen to combine the aspects of engineering he enjoyed, like finding innovative ways to solve problems, with his passion for art and storytelling. He likens his use of stage lights to painting, describing a process of curating what the audience experiences by laying down brush strokes of light. And although his specialty is lighting, he’s dabbled in a bit of everything in the theater world, at least behind the scenes. He has been a costume designer and a sound guy. He has worked as a technical director and dance producer. 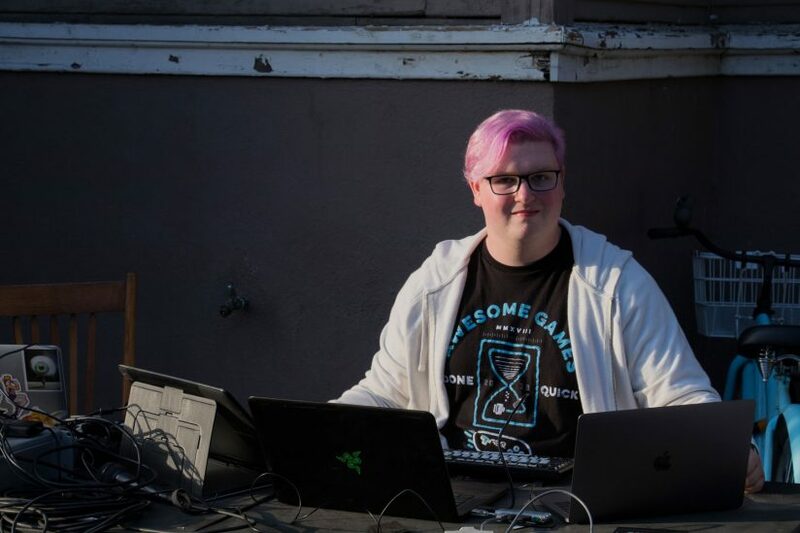 He’s also exploring computer programming and video game production. Thanks to his Stamps funding, Christiansen has been able to practice and refine his craft. He used some of the money to purchase the latest in theater technology, including LED lights, a light board, a sound board, microphones and a camera. That gear has also turned out to be a boon to student theater at USC. He also plans to use the funding to attend a technical theater conference in Florida this spring and a lighting design conference next year. Those opportunities likely would have been financially out of reach otherwise, he said. The scholarship is also aiding Christiansen in his latest venture. He’s launching a new student-led theater company with several of his fellow production classmates: Dorothy’s Friends Theatre Company is focused on telling positive stories about the LGBTQ+ community, which Christiansen sees as filling a gap in the arts scene. During a meet-and-greet with USC President C. L. Max Nikias as part of his Stamps Scholarship perks, Christiansen learned that students could pitch ideas and receive support through Visions and Voices, the university’s popular arts and humanities initiative. Naturally, he jumped on the opportunity and proposed staging Fun Home, a musical adapted by Lisa Kron and Jeanine Tesori from the graphic memoir by Alison Bechdel. Christiansen recently found out his proposal has been approved for Visions and Voices funding. He’s already planning for the fall production in Bovard. For now, the company is focusing on its spring show, She Kills Monsters, which opened this week and runs through Sunday. The dramedy traces the story of a young woman reconnecting with and learning more about her younger sister through a Dungeons & Dragons adventure her sister had written. It should be a breeze for Christiansen and his collaborators, but he remains cautiously hopeful that the company will succeed.